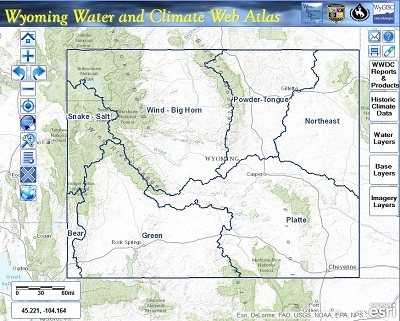 The Water Resources Data System at the University of Wyoming, in conjunction with the Wyoming Water Development Commission and WyGISC, is pleased to announce the launch of The Wyoming Water and Climate Web Atlas. This online web-mapping tool explores and delivers climate, weather, snowpack, streamflow, and State water development information. See also GIS Standards. The Web Atlas allows users to visualize different water and climate data resources in specific geographic regions, and then retrieve information related to that area. For example, if a water user is interested in applying for funding for a water development project from the Wyoming Water Development Commission, they can zoom-in to their of interests, click on the map and find out what reports, studies, or construction projects have been done in the vicinity. They can also find information related to area water rates, well depths and yields, stream gages, and where the nearest National Weather Stations are located to get information about the regions precipitation. The goal of this mapping portal is to allow Wyoming's water users and managers to find as much information they can, in one spot, on one of our state's most precious resources. Be sure to disable popup blockers or at least allow popups from wrds.uwyo.edu before accessing the Map Server. Please check the documentation of your specific blocker for how to accomplish this. Not all layers are visible at all scales. Be sure to zoom in to a general area of interest before turning on layers. Please note that the first time the map is accessed, it may take a few seconds to draw. First time users are encouraged to read the HELP menu, located to the right of the screen, before using the web atlas. While WRDS strives to make this application available at all times, please be aware that the application can be down at times for upgrades and data maintenance. The Web Atlas will work with current dailup speeds, however the user should be aware that certain functions and drawing times will take longer. Please be patient. Application performance can be increased through the use of broadband access available from local telecommunication providers.